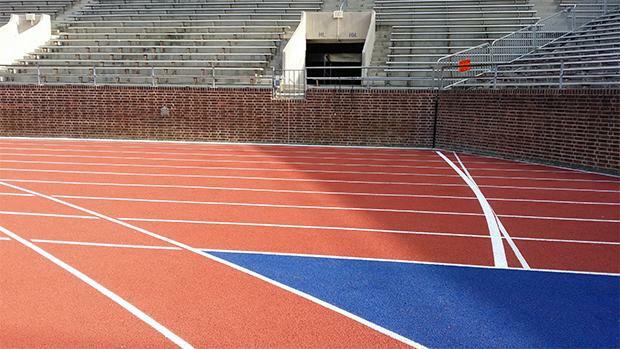 University of Pennsylvania unveils resurfaced track for upcoming Penn Relays! 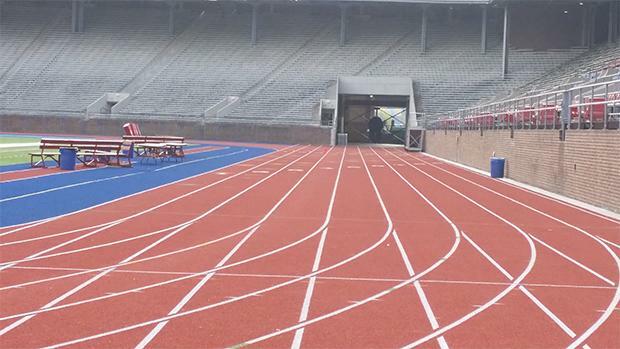 Thursday, the public were given a special opportunity to check out the nearly $3 million renovations done to the Franklin Field track at the University of Pennsylvania. The renovations started in May with the demolition of the old surface. 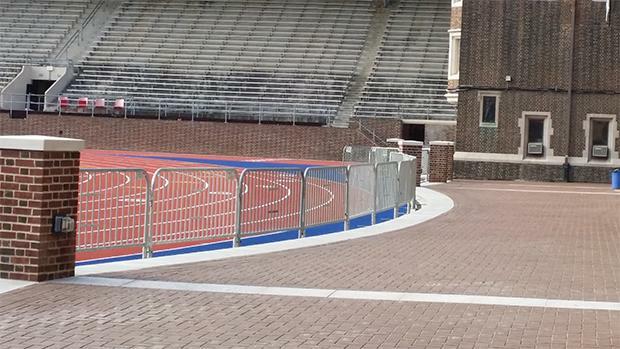 The entire oval was redone along with the jump and vault runways. The long and triple jump runways were extended to allow for more space for jumpers to sprint down the runway. The pole vault pits were moved to the 50 yard line of the stadium to accommodate two pits, one in each direction to allow the competitors to compete with favorable wind. The plaza area where the athletes navigate from check in to the paddock area has also been resurfaced. Plans are to lay a surface on top of the concrete to make it easier for the athletes to get around the area. As for the oval, it was laid out with APT ReKortan polyurethane, which has been used on the track since 1987. The steeplechase pit was moved from the outside corner of turn 4 to the inside of the track on turn 1 just past the Penn Relays finish line.. The moving of the water jump now gives Franklin Field two full sprint straightaways for the 100 meter dash and high hurdles, allowing the competitors the chance to compete with favorable wind conditions. The switch also allowed for a new 1500 meter line to be added, which will give the competitors a full straightaway for the first 100 meters of the race. Last but not least, the oval will still have nine lanes all around for individual sprints and sprint relays. Also, the railing will now be moved from between lanes 4 and 5 to lanes 3 and 4, which will allow for some fast times! 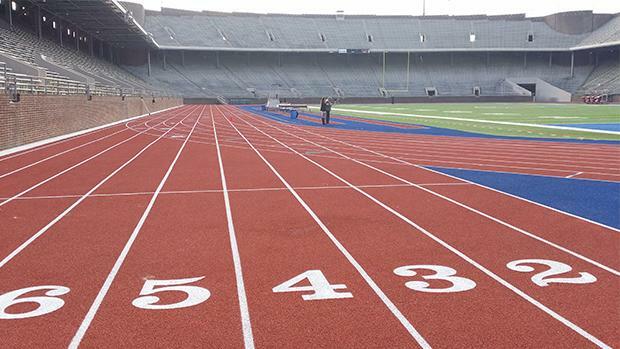 "The renovation allows the track to still have one of the widest radii in the country, which is important for running fast times," said Penn director of Cross Country and Track & Field Steve Dolan. As far as the direct impact with the Penn Relays, some of the individual events will see some changes with the renovations. "Individual events such as the 3000, the 5000, and the steeplechase will finish on the Penn Relays back stretch finish line, which is our main finish line for invitationals," said Dolan. As for the performance themselves, director of the Penn Relays Dave Johnson says to expect an improvement in the performances. "The times have always improved anytime we have resurfaced," said Johnson. "But this is more than a resurfacing. This is a complete retooling from the bottom up. So I expect times that we haven't seen on this track." Combine the resurfacing with the fact that this will be an Olympic year and the 121st Penn Relays should be very special. 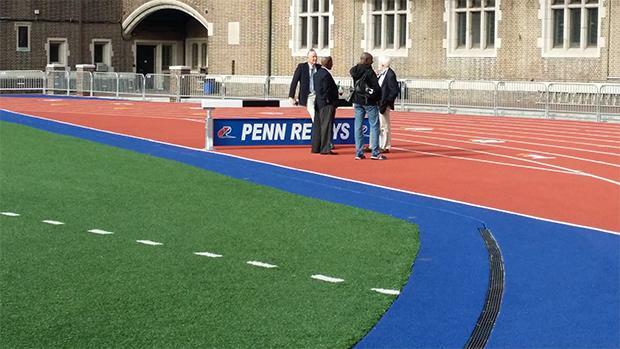 The Penn Relays are Thursday April 28 through Saturday April 30, 2016. Hopefully we will see fast times then, but as the meet director added, "if we have weather like this [70 degrees and sunny], then the times will be terrific."